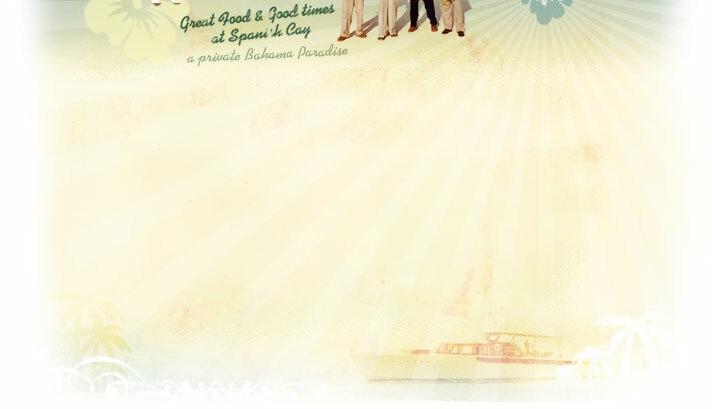 You are cordially invited to relive the incomparable Spanish Cay experience as portrayed in The Island Remembered. The great food and good times that were central to the Spanish Cay experience come to life in this book and over 100 original recipes from Spanish Cay appear in print for the first time. These recipes range from Bahamas native food dishes (conch fritters, grouper chowder...) to down-home Texan (grilled sirloin strip roast with barbecue sauce, barbequed spare ribs...). Dig In for Appetizer, Breakfast & Brunch, Entrée, and Drink recipes. Accompanying these recipes is the compelling history of Spanish Cay itself. The numerous interesting, and often hilarious, accounts of events and stories reveal Spanish Cay for what it was – a remarkable experience that will remain vivid in the hearts and minds of those fortunate enough to have lived it. Click on the book above to enter. © Copyright 2005 The Island Remembered. Website design & development by Compass Creative Studio Inc.